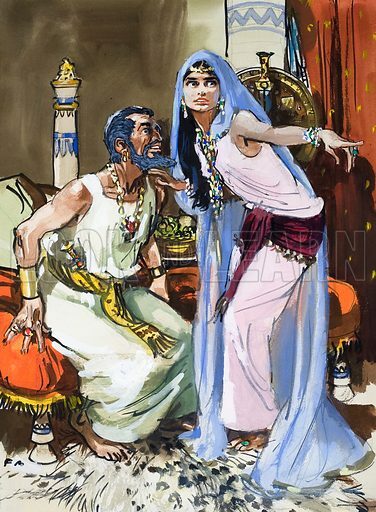 Jezebel talking to Ahab. In time, Ahab was killed in battle, and Jezebel was flung down from a tower to be eaten by dogs. Original artwork for illustration on p24 of The Bible Story issue no 21 (25 July 1964). Lent for scanning by The Gallery of Illustration. Available worldwide for immediate download up to 3,426 x 4,670 pixels.